Sheepdogs: Meet Our Nation's Warriors by Stephanie Rogish and Lt. Col. Dave Grossman provide children with a clear understanding of who the good guys really are in our nation. Children are often drawn to the character that they relate to the most. Whether it be in a film, novel, play, or video game. They find who they can relate to and cling to them. Why do you think that the most popular series that have hit the shelves the past couple of decades are filled with either wizards, witches, vampires or flat out darkness. Children fear their dark side. They don't understand it and they are confused. They often don't know how to deal with it. They think that it is simply, "who they are," or that they were "born that way." In their minds, they believe there is nothing they can do to change it. Sheepdogs: Meet Our Nation's Warriors will be one of the most important books that you share with your child. The authors share the difference between three types of people in the world. Sheep, wolves, and sheepdogs. I appreciate how the authors make the distinction between the actual animals and the people that they represent. A wolf is born a wolf and can do nothing to change it. People have a choice. They can choose whether or not to be a wolf or they can choose to be a sheepdog and protect rather than harm the sheep. This is a powerful concept for children. For the boy who has a fascination with guns. For the child drawn to war stories. So often, as parents, we tend to suppress a young boy's need to feel these things to prepare them for war and for battle. We think we are protecting them because we don't want them to be a wolf. Rather, we need to provide them with the tools to be a sheepdog, a protector of the sheep. When people visit my home the first question I usually get asked is, "where is your TV?" It's funny, because it's been so long that we've lived without one that I forget how abnormal it is to not have one. Yes, we are strict when it comes to entertainment but we are super lenient in other areas. We encourage our children to learn to shoot at a young age. They know how to use a bow and arrow. They have been taught, at a young age, important rules such as "never point your weapon at something you don't intend to shoot." And we allow them to practice these skills. I refuse to be fearful that my children will grow up to be wolves. If they are taught in the ways of the Lord at a young age then I believe when they grow old they will not depart for them. I love the verse that Col. Grossman quotes, Psalm 144:1, "Praise be to the LORD my Rock, who trains my hands for war, my fingers for battle." We need to let children know that it is the Lord that put in them a desire to fight and protect. This book mentions that there is a point when someone realizes that they can use what is in them to be a sheepdog and that it is okay, and it is powerful. That turning point is what so many children need. This book will open your child's eyes to the fact that they can be protectors of the sheep. They don't have to be wolves and they don't have to be simple sheep either. I was surprised, that as soon as I finished reading it to the kids and put it away my six year old daughter said with all seriousness, "I really liked that book." Not only is this a children's book, but a resource book that every parent should have on hand. 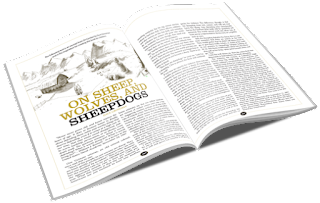 Col. Grossman's, On Sheep, Wolves, and Sheepdogs is included in the book as well as other resourceful information. Pick up a copy today. Why Mommy Carries A Gun, by the same authors! Col. Grossman's The Bulletproof Mind DVD Series? Disclaimer: I was provided with the above resource in exchange for my honest opinion.